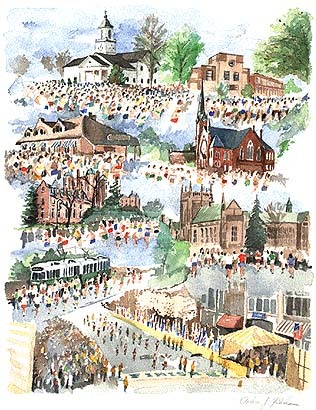 The Making of the Official 1998 Boston Marathon Poster! For the second consecutive year the poster has been created by artist Andrew Yelenak. "In December the designer, Donna Macleod, contacted me asking if I'd like to do the poster for 1998. For a lifelong runner and artist, does it get any better than this?" Andy details the project below. Hit TOC to return to this table of contents. 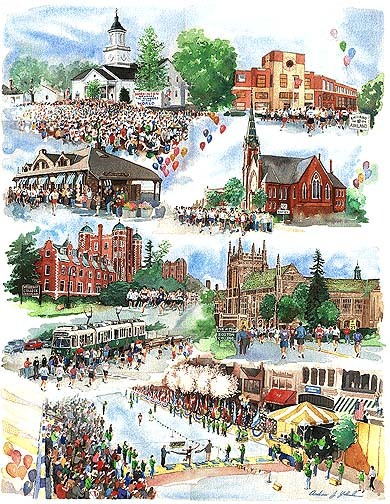 The Concept "The Road To Boston"
Donna Macleod, project designer, suggested that a painting encompassing all the towns the Boston Marathon runs through would make a memorable poster. That would involve eight towns, Hopkinton, Ashland, Framingham, Natick, Wellesley, Newton, Brookline and Boston. 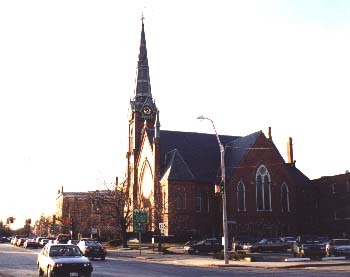 A landmark from each town would be painted and combined with the others to form a montage. On January 2, 1998 I traveled to the Boston Athletic Association's offices in Boston to comb through their files for suitable images to use as reference for my painting. The BAA has great shots of the start at Hopkinton, Heartbreak Hill in Newton and the finish, but during the other sections of the course their photographers focus on the runners, not the surrounding landmarks! I came away with some excellent slides, but I would have to make a second trip to take my own photographs. A week later, after waiting for a sunny day, I shot additional photographs at other memorable spots on the marathon course. I scheduled my visit to each town so the time of day would be similar to the time the runners would pass through on April 20th. Here are a few of my photographs that were used as reference for the final painting. Click on a photo for a large view. the Natick town green. Wellesley College. I produced this sketch at 1/2 the size of the final printed poster size. the designer in Illinois who approved it and shipped it to the BAA for their review. Click on the sketch to see a larger view. The were only a few minor changes suggested for the final version. The BAA asked that the overall winner be shown breaking the tape instead of generic runners at the finish. Since so many runners were to be included throughout the painting, I was happy to include only one at the finish line! I did add the second place finisher, just to make it a close race. Here's a detail from the finished painting. To help identify each section of the painting, it was suggested that road signs be added with the town names. To avoid a repetitive look, I tried to find a unique ways to incorporate the town names. 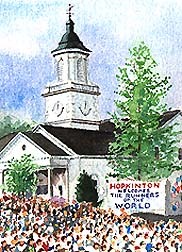 I used a homemade banner in Hopkinton, I added a "Framingham" sign to the old train station, a Wellesley College sign in Wellesley, and I put a "Brookline" sign on the train there. Now that I had approval of my sketch, I created a detailed base-drawing on a sheet of 300 lb cold press watercolor paper. The final painting will be done at 150% of the printed poster size. Doing this causes the painting to look very detailed and "tight" when it is printed in the final reduced size. The watercolors were painted directly over the drawing and then the pencil drawing was erased. 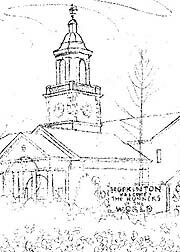 Here you see a detail of the painting, the First Congregational Church in Hopkinton, in the base drawing and the finished version. The graphics here do not display the refined and detailed nature of the actual painting. The final watercolor painting took approximately 120 hours to complete. I made a few additional departures from the approved sketch for compositional reasons. I reduced the number of runners throughout the painting because my intention was to focus on the landmarks of the towns, and the sketch had become a little too cluttered. I think a cleaner look was achieved by providing more space around each vignette. Lastly, I eliminated the overhanging tree in the upper right corner of the sketch. It would have been too prominent an element, throwing off the balance of my design. Here are a few details from the finished painting. Billy's Breakthrough - Commemorating Bill Rodgers' landmark Boston Marathon victory in 1975. A Boston Legacy - A tribute to four marathon legends.